When I first saw the Cable Luxe Tunic pattern a few years ago, I knew right away that I wanted to make one. But I had plenty of other projects on my plate, and it was only a few months ago that I found myself ready to make it. Fortunately, by then the pattern was free (hooray!). Armed with 40%-off coupons, I went to my local Joann and bought some Wool-Ease yarn. Usually I shun acrylics, but this yarn actually isn’t bad. It’s also the one called for in the pattern, and after looking at the Ravelry pages of completed projects, one that lots of people had used with great success. I cast on some time in November and finished a couple of days ago. 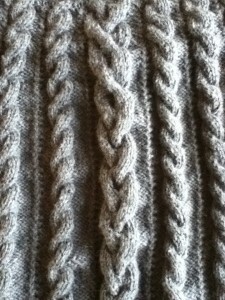 (Details are on Ravelry here.) 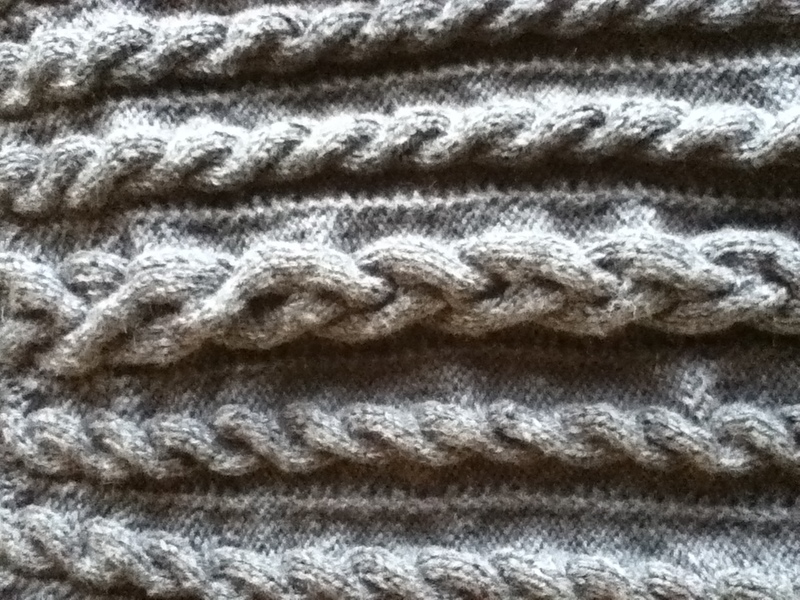 There were a few mistakes (of the gnash-my-teeth-while-ripping-out-because-DAMN-IT-this-thing-is-going-to-be-PERFECT), but this pattern wasn’t very difficult-—especially after I’d written a row-by-row list of which cables crossed when (and how). 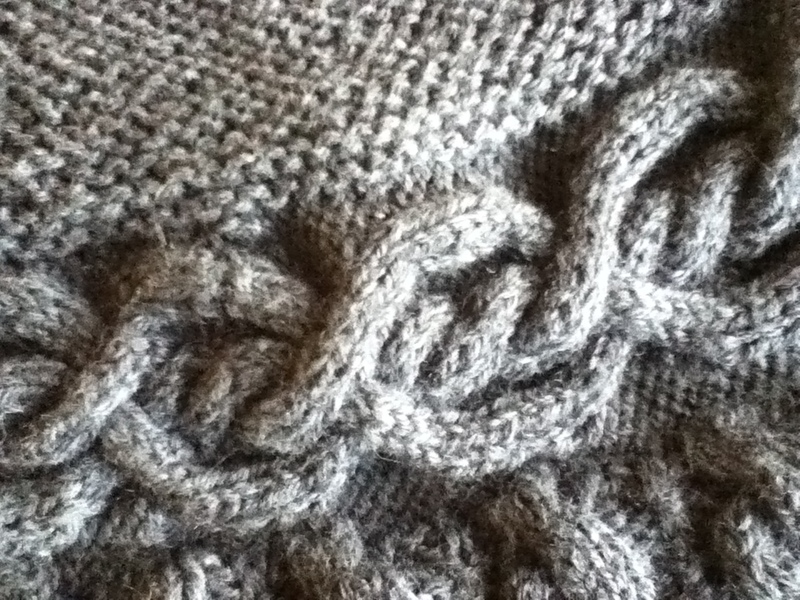 (Keeping track of two different cable patterns—one over 8 rows and one over 12—in my head was beyond me!) Once I got into the groove of it, it even became “mindless knitting” of the sort I could easily do while watching a DVD or hanging out with friends. I followed the pattern exactly as written with one exception: I added about 3″ to the length of the body, so it would not ride up above my waist in the back as I moved around. Right now, it hits at mid-hip, which is just right for tunic-not-dress length. The sweater flares out a bit at the base, which makes it not clingy at all. I’d plot out how to knit the whole thing in the round. As it is now, it was done in one piece, but I did have to sew up the sleeve seams and the side seams. If I could avoid that seaming altogether, I’d be very happy indeed. 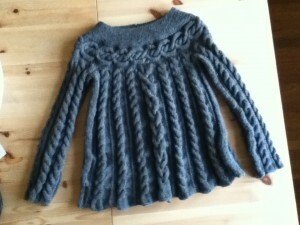 Another possibility: converting this into a cardigan. That would mean eliminating the awesome center cable in the front (though I’d still have one in the back), though, and I’m not sure I want to do that. I’d add a tiny bit more space in the armpits. Right now, they are pretty snug up against me. They’re fine when I’m wearing a close-fitting t-shirt underneath, but anything more voluminous would be uncomfortably tight. Can’t wait to see it on you! It looks great on you, too. Marsha, that is BEAUTIFUL, you should feel great about a project such as that which you have accomplished. Marsha! I can’t believe how late I am to the party, but this is AMAZING! I put a baby flag on this pattern when I saw it, too, but was bullied into not casting on by all the cables. Please show us a picture of you wearing it! @Jean: I will show it to you in person next month! :) The cables are not hard at all. This sweater is surprisingly easy to knit—it looks way more complicated than it actually is. YOU CAN DO IT! Marsha recently posted..Which of these would you put on your list?